A diary is a more personal and intimate document, wrote one colleague of mine. I have been a regular diarist since 1983. I wondered at times, as blogging became more prevalent, what is the difference? At times there is overlap, at times there is a very big gap. As we crossed the Rose Garden of Hauz Khas, the breeze had a different feel in the early morning hour. Here we had witnessed the Azaan from the mosques at Hauz Khas on several evenings, before crossing over to Park Baluchi at Deer Park to share some thoughts and feelings. But that seems a long time ago. As I tried to explain to my sister who says, she still feels that she will see her mother walking around, that all people have to go, we sat down and celebrated her life. But there are times when philosophizing, reflecting and words fail us. The lawns and museums around India Gate-Raj Path area have been a favorite haunt of mine for many decades. “Who is Nandalal Bose” I asked them. They did not know before the trip started. But after the trip, hopefully they will not forget the name of the artist who art scholars regard as one of the founding fathers of modern art in India. 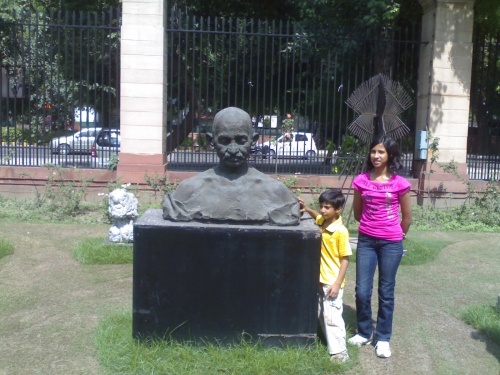 This entry was posted in life and tagged Delhi, Diary, Walks. Bookmark the permalink.